Sven and I enjoyed the Fremont Fair. In particular, Sven really enjoyed the Super Slide! We took Sven to the Methow Valley for the weekend, and he said it was the best weekend he had every had. This, from a kid who has visited Disneyland, Disneyworld, and Legoland. I asked him why it was great and he listed all the things he enjoyed: two days of skiing, pizza for dinner, good breakfasts (cheese/mushroom omelette, and huevos rancheros), and swimming & hot tub after skiing. We covered almost 20 miles in two days - 13+ miles on Saturday, 6 miles on Sunday. His only complaint was sore muscles at the end of the weekend. We all had so much fun in the beautiful Methow Valley that I think we'll do it again next year. It turns the dead wood into extraordinary life"
This is the first line of a poem Sven wrote in class. Unfortunately, we can't read all the words in the following lines. - Read the first Harry Potter book. He read most of it out loud to Granma while she was here this summer. Now he is reading the Goblet of Fire to himself. - Did his first Kid's Tri in Kirkland Sept. 19th. The transition was tough because it was very very muddy in the transition area. It took him awhile to get the mud off his toes. - Went to China with PoPo and Ojiisan. We all had a great time. I got the following message on my mobile phone from Sven "Daddy - I'm talking to a computer!" Its interesting that he knew my voicemail system was a computer. Is this so obvious? Sven is now reading the third "Diary of a Wimpy Kid" book, and has seen the movie. So, he asked us for a Diary or Journal. Yesterday, Erik bought him a nice looking Journal. His first entry was "Amino Acid - Serine". Then he drew a model of the molecule. He also wrote on the title page "Sven Nilsson1" for dimension 1. Under that he wrote "Mr. Nilsson2" for dimension 2. Hm, I am not sure where he is getting this, but it is fun to watch. According to Sven, one of the "best movies ever", is Der Lauf Der Dinge (The Way Things Go). He has seen it several times, and never seems to get tired of it. This is a kid who has seen Avatar (the one with tall Blue Pandorans), the latest Star Trek movie, and Transformers. Its the real stuff that is still impressive. Its one of Erik's favorite movies also. Sven has recently discovered the joys of reading books to himself. He started with Diary of a Whimpy Kid, but he has really picked up velocity with the Captain Underpants series. I bought him an 8 book set, and he is reading about 1 book a day. He is already talking about bringing them on trips and reading them again. Sven is learning to ski! This year Sven said he wanted to learn to ski, so we signed him up for some lessons. Here he is at Summit West at Snoqualmie right before his first lesson. The snow was pretty wet, as its been unusually warm, but I think that made it easier for him to get around on the skis. Not so great for skiing though. By the end of the lesson Sven could turn and stop. Next week, Sven might be ready for the lift. We spent Christmas in Half Moon Bay again. Michi's house has a nice fireplace to hang stockings, so we took Sven's stocking and hung it next to his cousin's. On Christmas morning, Sven looked in his stocking, pulled out some candy and said "I hope the stocking isn't full of candy." His cousin stared at him, not quite comprehending what he had just heard. Despite finding the candy in his stocking, Sven had a good time at his cousin's house. He greatly enjoyed playing with his cousins, their video games, and their trampoline. We also enjoyed the warmer weather and stunning views of the surf, when we went jogging on the coastal trail. All in all a very nice Christmas week in the Bay Area. Sven and I had a fantastic time at WDW. Erik - not so much. He had a cold, that made him tired. But, we all greatly enjoyed Halloween. It was a huge big party at the Magic Kingdom. The best part (according to Sven) was rides! Its been a birthday celebration week. Sunday we had Sven's birthday party - pizza, Planet 51, cake, pinata. Fun was had by all. Then we dashed off to the MLS Cup Final, where we had fantastic seats, thanks to a friend. Today is Sven's actual birthday. We told him our recent trip to Disney World was his main gift. So, when asked what he wants for his birthday he says "I don't know." On our recent trip to Vancouver we decided to enjoy the splendid September weather by doing the Grouse Grind, nicknamed "Nature's Stairmaster". The trail is only 2.8 KM, but the elevation gain is 2,900 ft. Erik pointed out the irony of measuring the distance in metric, and the elevation in feet. For those of you who do much hiking, that is a very steep climb - an average 30% grade, which is steeper than the Mt. Si hike which averages 1,000 ft of gain per MILE. We started around 10:30, and already the trail was very crowded. By the time we finished, one could see a steady stream of climbers coming up the trail. Sven led the way for us, and it was difficult, as the steps were obviously designed for adult legs, not kid legs. Often, he had to pull himself up a step with two hands. But he did a great job of scrambling over rocks, roots, and large steps to get to the top - and there was very little complaining. He said his legs were getting sore, but that was it. We met several groups with kids, and not a single one looked happy. 1.5 hours after we started, we were at the top and enjoying the fantastic view. We took the cable car down, as hiking down is not allowed. Yesterday Sven and Erik ran the Jock n' Jill 4 Mile race. It coincides with the Jock n' Jill 1/2 Marathon that is held each year on Labor Day. Here is Erik's write up of the event. Sven's official time was 45:25, a 10:47 pace. (The course was a little over 4 miles.) Sven was the fastest 7-year-old. There were only two 7-year olds, and no six-year-olds, so there's a 50% chance he was the youngest finisher at all. Sven finished 298 out of a field of 489. He also finished almost a minute faster than the *average* finish time. Sven's division is boys age 19 and younger, so he didn't win his division. He placed 28 of 33. Most of the people behind Sven were adults although he was faster than several fit-looking older kids. Not bad! Sven did a 1-mile race last year, but there were no official times. So this was his first regular road race and he did very well! The other thing was there was a mass start for both the half marathon and the 4 mile, so the three of us got to start the race together, and run together for about half a mile. But it also meant Sven had to contend with a big mass start of adults who were not necessarily looking underfoot for kids. Sven dealt with the challenge well. Best of all, he had a good time. What does a boy who doesn't believe in the Tooth Fairy get when a tooth falls out? Earlier this year Sven informed us he didn't believe in the Tooth Fairy. But he wasn't so sure, when his tooth fell out this past weekend. We asked if he was going to leave it out for the Tooth Fairy. He gave us a strange look then agreed to leave it out on his bed in an envelope. He also told us that since his blanket in the summer was lighter than his winter blanket, he will be able to feel the Tooth Fairy when she arrives. However, the next day, after getting the money, he tried to find ways to trick us into admitting we were responsible. He even tried to tell Erik that he didn't get an allowance this week, because he already got his money. Next time, maybe we'll just directly deposit the dollar coins in his piggy bank. He still has several teeth to go, and having Erik leap out of bed at 6:30 AM because he forgot the Teeth money is no fun either. Sven, Fafa, and Erik went to the park yesterday, to see if Sven was ready to ride his bike without the training wheels. After a few frustrating attempts he was able to ride without the wheels, and stopped without falling over. He was so happy, he wanted to throw the training wheels away at the park. Frugal FaFa had Erik retrieve them. Afterall, the bike will probably be worth more with the wheels, if we decide to sell it. Sven asked for a paper to draw a special picture. When he was done we asked what it was and he said "a binary picture of a rocket"
Sven and I were eating chow mein for dinner with our chopsticks, and towards the end Sven wanted to do a "chopstick fight". So I said I would try to grab the tofu off his plate. I attacked, and he successfully defended a couple of times. Then he grinned and said "prepare to eat nothing!" Sven told us that there isn't any difference between the "good guys" and the "bad guys". They both kill people to meet their objectives. He cited the Star Wars movies as his example. This led to a philosophical dinner discussion about what is bad behavior, and what is really bad. Of course, some of it went over his head. Sven was showing an interest in learning some "symbols", so I showed him the Chinese Characters for the 4 elements that were on some golf balls at the Wing Luke museum gift store. They had "fire", "earth", "water", and "air". Today, he showed me his "fire" symbol. He had drawn it on a small piece of paper and drew a circle around it. It looked pretty good for 7-year old Kanji. Sven refers to these three mythical figures as the "Three Secrets" that parents (try to) keep from children. He doesn't seem much bothered to discover this state of affairs. Do you remember how old you were when you figured out there was no Santa Claus? This weekend, Sven figured it all out and shared his conclusions. First, he figured out that there is no Easter Bunny. I guess we were suspiciously knowledgeable about the Easter Egg locations, and when we invited his friends over for an Easter Egg hunt, he figured we must be the culprits. In the last couple of weeks, Sven reading has taken off. He can now pick up easy books, and read through them, with a little help. He says he "loves to read." Another milestone. Sven is very interested in building big complex robots. I explained that his plans were ambitious. A few days later, he was in his room, playing with his new electrical kit. He was building a simple robot and planned to trade it in for parts to make a more expensive robot. Then after a few more trades, he said "I'm going to build a girlfriend, and she'll become my wife." Recently we had brussel sprouts for dinner - they were picked from our garden, and Sven participated in the harvesting. A few days later Sven opened the fridge and said "Mom, there's a giant brussel sprout in the fridge". It was a cabbage I had bought to make soup. For Valentine's Day Sven had to sign 26 cards for his classmates and teachers. 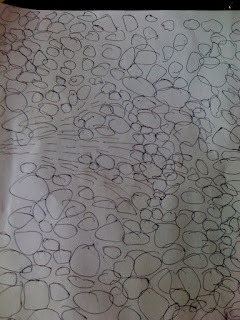 Before we started Sven asked if I would teach him "scribble writing" , i.e. cursive. His printed handwriting is still not very good, but I taught him how to write his name in cursive anyway. So, all of his Valentines this year had his new signature. Yesterday we were eating Girl Scout cookies, and Sven said "I want to be a Boy Scout." I guessed the comment was related to cookies. So I told him Boy Scouts don't sell Girl Scout cookies. And Sven said "Of course not, they sell Boy Scout cookies." When we told him they didn't sell ANY cookies he was confused and said "What to do they do if they don't sell cookies?!?" Sven had his first fist fight last week. Fortunately, it was not with a class bully. Unfortunately, the fight was with a good friend. According to adult witnesses, they both landed punches. Sven ended up with a bloody ear, but his friend "got into more trouble." However, 3 days later, Sven went to his friend's house for a play date, and all seems patched up between them. Sven thinks today is President's Day because we get a new President. Even though I corrected him a few days ago, he reiterated his belief this morning, that today is President's Day. Well, maybe it is! Erik is going to watch the Inauguration Speech with Sven at 9:00, so he is going to be late to school. After spending the summer with FaFa and Granma, Sven has become an Obama fan. When asked who should win the election he says "Joe Biden and Obama!" On Friday, Sven donated $12.00 (6 weeks of allowance) to the campaign. Technically, it goes to the WA State Dems, since people under 16 can't donate directly to a political campaign. He was very excited and covered in campaign stickers when he got home. Yes, Sven graduated from Kindergarten, and we have pictures to prove it. This weekend we were in Borrego Springs to celebrate Erik's Mother's Birthday. We took Sven on a couple of hikes, including one called "the Slot" - a canyon that narrows to 12 inches in places. Sven loved the desert adventure and kept saying "this is a big world!" He was impressed with the height of the canyon walls. The next day we hiked to an oasis in Palm Canyon. The Palm Canyon hike was 3 miles round trip and mostly in the sun. Sven held up well, and was still running and scampering around at the end. Towards the end of the hike, Sven and I pretended we were on Tatooine, and we were trying to find our Landspeeder. Sven must have heard the term "sugar high", but heard it as "sugar hive". Now, when somebody does something he thinks is wrong, he wants to give them a sugar hive. For example, yesterday a cyclist nearly hit us, as we were crossing the street, so he said "let's give her a coffee sugar hive." Its so cute, I'm not correcting him. Sven is also becoming a health nut. Yesterday, we were at the Blue Star in Wallingford and we were discussing the options on the Kid's Menu. Sven always orders the Mac and Cheese, which comes with fries. This time Sven said "is the fat in fries good for you?" We told him it wasn't good for him, but he gets fries so rarely we always let him order them. When the waitress came to take his order he said "I want the Mac and Cheese, but is there fat in the fries?" When the waitress said yes, he asked for something else instead. She offered him a salad or black beans or refried beans, and he chose black beans. This was all without any prompting from us! The waitress said "is he trying to watch his weight?" I said "all 39 pounds of him." Sven loves to strike up conversations with new people all the time. He generally approaches young good looking women or families with kids. Yesterday, we were waiting to start our usual Monday Greenlake Walk, and Sven was saying "hi" to a group of teenage girls, who looked like they had just finished a workout. Sven was surprised when one of them looked at him and said "hi Sven!" He looked at us in confusion. When we asked him who it was he said "I don't know." It turns out, she is the daughter of his Kindergarten teacher, and she remembered his name! For Ojiisan's 80th Birthday, the whole family walked around Lake Union. Sven managed to finish the 7 mile plus hike, with a minimum of complaint. Lake Union itself is almost exactly 6 miles, but we walked from our house, to the lake and back. Also, Sven started the walk by running ahead, and then running back to the rest of the party. So, he actually went further than anybody else. A few times Sven wanted to stop to "recharge" his batteries, as he was pretending to be a robot. His biggest frustration was being forced to continue the walk, rather than spending more time "playing" along the way. We let him play a little bit on a playground at the South end of the lake. Ojiisan and PoPo also finished the walk, though PoPo had a hurt knee, so we were a little worried. We ended the hike by eating cake at Simply Desserts in Fremont. Easter 2008 in Seattle was soggy and wet! We had our usual brunch with PoPo and Ojiisan. 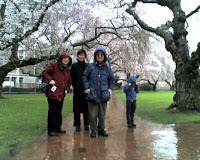 Aftewards, we went to view the Cherry trees at the University of Washington. As you can see, Sven wasn't extremely happy about the rainy tree viewing. We were joined by several other Asians, carrying umbrellas and tripods. Later in the day we went to Eric, Ami, and Nadjia's house for their annual Party and Easter Egg hunt. The eggs retrieved were soggy and muddy. The kids still had a great time though - the thrill of finding hidden eggs overcame the rain and mud. Sven quickly filled his basket, so I told him he had to help the smaller kids find eggs. He spent much of his time looking for small kids in need of his assistance. Sven's favorite Easter present was some Silly Putty I put in his basket. He calls it an alien symbiote (like the Venom suit in Spiderman). He plans to bring it to show and tell this Friday. This might be Sven's first flu. Last week he had a cold, but yesterday he woke up coughing like crazy. I thought it was bronchitis from the cold, but during the day, he developed a fever, lost his appetite (a good indication that something is wrong), and kept wanting to pretend he was a sleeping cat. Last night he was scared by the symptoms. He started crying because his limbs were aching. His eyes were so watery that he couldn't see me very well. This also alarmed him. Today, we've been watching movies and reading books. We started reading the Visual Companion to the "Fellowship of the Rings" movie. Afterwards, Sven said "I'm an elf and you're a girl elf. But only boy elves have bows and arrows." When I asked why, Sven said "Girl elves don't like weapons. They only like peace." But since he is a boy elf, he is running around playing Legolas, when his runny nose doesn't get him down. Boys / Girls - how does that get determined? Sven is creating all sorts of theories about how the world works. Recently he has been interested in what causes a baby to be a boy or girl. First, he tried the theory that a baby becomes a boy if the parents give it a boy name. But when we told him that the opposite was true, i.e. a boy is given a boy name because it is already born a boy. A day later he said "I know how a baby becomes a boy or girl. If the Mommy eats lots of food when the baby is growing inside, it is a boy because boys are bigger." Not a bad theory. While we were in Half Moon Bay for Christmas, Sven learned how to count to 100. He had to learn a few rules, e.g. he counted twenty-nine, twenty-ten, twenty-eleven, twenty-twelve. So, we taught him thirty. Then he got to thirty-nine, thirty-ten. So, we told him about forty, fifty, ... Sven managed to get all the way to ninety-nine, then he said ten-ty! Yesterday morning, I couldn't read the kitchen clock, so I asked Sven to tell me what time it was. He said, how do I do that? I told him to look at the clock in the microwave and he said "its one thousand seven". Sure enough, it was 10:07. While were were visiting Half Moon Bay during the holidays, we took the kids on a horse back ride. Sven did a great job on his full size horse. Erik told Sven to pull on the reins and say "whoa" if he wanted his horse to slow down. Since Sven's horse liked to be near the front of the pack, it had to gallop a few times to stay in its preferred position. One time, Uncle Jim heard Sven say to his galloping horse, "I know you like to be the leader, but not today!" Sven was thrilled by the ride, but got very cold because of the wind. I think the strong head wind along the beach finally got to him. Here are some pictures from the ride. These were taken by Erik on his mobile phone camera. I had my Konica, but since my horse liked to be near the rear of the pack, the only pictures I could take were from the back. Also, I was also nervous about riding, so it was difficult for me to take pictures with one hand. Up until now, Sven has been reading by memorizing how some words look, e.g. his name "Sven". But this year he has started to sound out the letters. Yesterday, he managed to read his first word phonetically. The word was "off". On Friday we had dinner at PoPo and Ojiisan's house. Sven finished his dinner early, so he was playing with one of Ojiisan's puzzles in the living room. It was an Adam's Cube and I thought he was randomly playing with the pieces. I saw him drop and retrieve the pieces on the floor and couch a few times, then after 30-40 minutes he said "hey I made a big square." He had managed to get the pieces back in the correct square pattern. This is a puzzle that several adults can't even manage (including this Mommy). 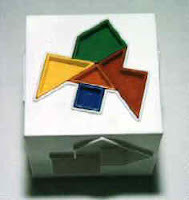 The picture of the puzzle shows another pattern that can be made with the same pieces. 1/2/08 update: Sven played with this toy again yesterday during New Year's Dinner, and did this Rocket. How many hands does it take to learn? Sven is getting over a cold. We kept him home from school for one day, but the next day we told him he had to go back. Sven shook his head and said "no, I can't go to school, I have to blow my nose." When I told him he could blow his nose at school he said "But, I need both hands to learn." Sven's cold has also produced some funny rhymes. After getting an upset stomach from too much mucus he said "snot in the tummy is not funny." His ears are also plugged which led to "fluff in my ear, I can't hear." Sven has now lost his first two baby teeth. The first came out on Thanksgiving and the second came out last Monday. 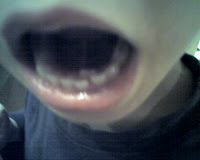 His permanent teeth were already growing in, so he doesn't have a big gap in the front of his mouth. In fact, its hard to tell that he has recently lost 2 teeth. Last weekend, Sven and I did another race - the Annual Jingle Bell Run. Sven and I did the 1 K Run with the Elves, which he finished in under 10 minutes. Then I handed Sven off to Erik, and did the regular Jingle Bell Run. Sven thought the jingle bells on his shoes were pretty cool - and he got an official race t-shirt. More than he got for doing the Seattle Kiddie Marathon. For Erik's birthday, Sven picked out a card that had a picture of the Buddhist Wheel of Life. He asked about the picture, so I gave him a quick overview of reincarnation. A few weeks later Sven came up to me with tears in his eyes and said "Daddy said Addis is dead. Is Addis really dead?" When I said yes, Sven said "Maybe Addis is something else. Maybe he's a cow." Sven seemed to feel comforted by the thought of Addis being around in some form or another and the tears stopped. A couple of weeks ago, I took Sven and his friend Thomas to see a movie. On the way to the movies, Sven and Thomas had a huge argument about what happens when somebody dies. Sven insisted that the person comes back as another being. Thomas said "when you're dead, you're dead forever." Finally after some heated discussion, I said "It's OK to believe different things." Thomas concluded by saying very loudly "I'm right AND you're right." Yesterday Sven finally did the 2007 Kiddie Marathon - i.e. the last 1.2 miles, on his 6h Birthday. It was difficult taking an action shot, but Erik managed to get one of Sven as he approached the Finish Line. Sven ran strong until the end and said "that was easy." He really took off on the biggest hill on the course - I had to run to catch up. His form was good, he paced himself well, and I think his time was fairly good. Unfortunately, no timing clock at the Kiddie Marathon, so we don't know his exact time. He was definitely one of the smallest kids there. There HAS to be a blog entry for Sven's first trip to Disneyland! We took Sven to D-land for an early 6th Birthday present. The timing coincided with Erik's Uncle and Aunt's visit from Finland. We decided to visit both Anaheim and Vista for an early Thanksgiving family reunion. Sven LOVED Disneyland - what kid wouldn't? We started with Flying Dumbo, but soon wandered over to the Matterhorn. We discovered that Sven is a Roller Coaster boy, so then we tried Thunder Mountain Railroad. He had a huge grin on his face when we were done. He also enjoyed the Holiday Haunted Mansion, Star Tours, Astro Orbiter (which scared me because I hate hieghts), and Space Mountain. Especially Space Mountain. We went back a second time on several of his favorites the next day. 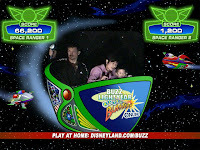 The picture is from the Buzz Lightyear ride, where you can use a blaster to shoot at targets (to get more batteries apparently). Sven says that this is his favorite. Its getting c-c-c-c-old in the evenings. Also, we're running in the dark now, thanks to the time change. Sven is still running 2 miles at one time. The weather is getting colder, so its harder to get going these days, but we are making steady progress to the goal of 25 miles before his birthday. Last year before Halloween Sven said he wanted to be a ghost, with a white sheet and two holes cut out for the eyes. But Daddy (Erik) and Sven decided on a robot instead. This year, months before Halloween, Sven reasserted his desire to be a ghost. He even went looking in our closests and found a white pillow case that he thought would make a good costume. So, I decided to go with his plan. PoPo gave us and old white sheet, I sewed up the sides and cut out two eye holes. You can see the result was exactly what he wanted. Sven and Thomas, Sven's best friend, went around our block and did a great job acquiring cheap candy. As with past years, Sven's biggest thrill was showing off the costume. This year, he liked being "scarey" and would yell boo at the witches and other bad looking characters. I put on some vampire makeup, and I was introduced by Sven as "my friend, a vampire." Sven's Kindergarten class also did a Halloween field trip to Fremont, and as a result, we have several pounds of candy we need to sort through. I might be making some M&M cookies in the near future. This weekend we bought Sven a new pair of running shoes. I decided that the cheap pair that we bought at Fred Meyers might not give Sven the support he needs if he starts running longer distances. Yesterday he ran 2 miles (8 times around the track). On Monday, Sven ran 7 times around the track. He is hoping for 8 by next week. We still don't know how long his school fundraiser lap is, so can only count his track run this week. Allowance & What is the going rate for the Tooth Fairy? We decided that Sven can manage some of his own purchases, so after much debate and asking around, we decided on $2.00/week. Immediately, he started saving for a black flashlight that he saw at the Olympic Sculpture Park. So far, its been a mixed experience. Sven values his own purchases much more. However, now, when we got to tourist attractions, we have to give him some time to shop. He is much more picky about what he wants to buy though, so when we went to Vancouver recently, he considered several items, but didn't buy any of them. Our next challenge - what does the Tooth Fairy give out these days? Sven has a very loose tooth, that may be coming out any day! Sven ran 6 times around the track yesterday. He was very excited and wanted to call FaFa right away. Sven has signed up for the Seattle Kiddie Marathon. He is supposed to run/walk 25 miles before November 24th, and on the 24th he will run the last 1.2 miles to make a complete 26.2 miles. Since Sven is now in Kindergarten, he has been learning new reading and math skills. A few days ago, I heard Sven try to figure out how to spell a word, by sounding it out. We've had an excellent summer. Early in the summer Sven took swimming classes, and still enjoys dunking his head in the water and floating unassisted. Sven has also been doing some running with FaFa and has been able to do a 13 minute mile a few times. Sven can also walk all the way around Greenlake - 2.8 miles. At the end of July, we went backpacking on the Washington Coast and Sven hiked the entire way to Third Beach. Then we hiked over a large headland called Taylor Point. Going up the headland was steep and muddy, and ladders with ropes were required to get up. You can see Sven and Erik at the top of the first of 3 ladders in the first picture. Sven enjoyed the challenge and the 2nd pictures shows Sven on the other side of the headland with very muddy shoes. Soon after this picture was taken Sven asked us how we were going to get back to our camp site. He seemed a little shocked that we had to hike all the way back! But, he made it, and the next day he managed to hike out of Third Beach, which was also steep coming off the beach. This summer has been full of new milestones for Sven. Sven just finished his first full swimming lesson course, so he can now swim around a pool with a kick board. He is also comfortable putting his head under water and blowing bubbles. Sven's FaFa and Granma are back in town. FaFa has been working with him on his running, and Sven can run a 13 minute mile. He is pretty quick, and can easily pass joggers on the Greenlake trail. Of course, he can't sprint that fast all the way around the lake yet, but soon. Maybe, the Aikido class he took in the Spring has helped with speed. It has certainly helped with his agility. Last weekend we took Sven hiking up to Denny Creek. On the return trip he ran all the way back down to the parking lot - nimbly bounding around roots, rocks, and mud puddles. I could barely keep up with him (wearing a day pack and all). He is already eager to go on a backpacking trip to the beach (Third Beach). For the annual Fremont Solstice Parade, Sven was an otter with the "Styrofoam Free Seattle" group. He spent two hours slowly marching and waving his otter tail from Fremont to Gas Works park. I was amazed at his stamina - though he was very tired at the end of the parade. With physical development, also come emotional maturity. This morning, Sven woke up right before I left for work. Sven said "Mommy, I'm mad at you." - meaning he was mad I was leaving so soon after he got up. I told him I let him sleep late because of the fireworks last night. After a couple of minutes of talking I said "I have to go - you can either kiss me good-bye or stay mad." He then gave me a big hug and kiss, and said "good bye". I was amazed at how quickly he recovered. I thanked him for the nice hug. More to come soon - highlights from trip to Serbia and Montenegro. Sven and I went to Jazz Alley last night to see Angelique Kidjo. Erik was home recovering from a chest cold type virus thingy. I told Sven we were going to a Night Club, so he thought the dark room was supposed to make it look like "night" inside. Sometimes attending an event with a young child produces nice benefits. Jazz Alley is a dinner music club, so they seated us right next to the stage. We had one of the best tables in the whole house. Since we were inches away from the speakers, I told Sven it might be a little loud, and he said that he liked loud music. After Sven ate an adult-sized dinner, and a huge dessert, Angelique started around 7:40. Sven was enthralled. Towards the end, Angelique encouraged audience participation, and roamed the room with a mic, encouraging people to sing. She held the mic up to Sven, and he quietly sang the chorus "Ashe e Maman, ashe e Maman Afirika, Ashe e Maman, ashe e Maman Afirika." He looked beside himself with excitement. Then she kissed him and left lipstick on his cheek! For her last 2 numbers, Angelique invited people to join her on stage. She first pulled Sven up to the stage and he looked very confused about why he was standing on the stage by himself and the band. But then others joined him at Angelique's invitation. 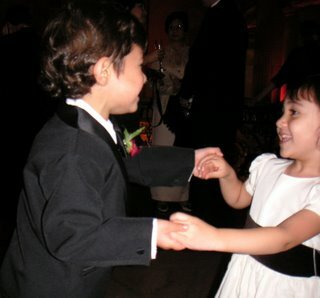 He still wouldn't dance without me, so I finally joined him. He danced and danced and danced. When we got home, we showed Daddy Angelique's lipstick mark. Sven has shown an interest in running, so yesterday, we ate some running food, put on some running shoes and his running suit, and went for a jog at Greenlake. He managed to jog "a whole mile." Then he turned around and walked back "a whole mile." He was very happy that he didn't need to be in the jogger at Greenlake anymore. Today, I took Sven to a car dealer to buy a car. On the way there, Sven said "How are we going to get the car home?" I responded "what do you think is a good way to get it home? ", thinking he would tell me to drive it home. Instead he said "I'm going to do a zillion push-ups and then I'll carry it home." Later, at the car dealership he decided that a car carrying machine might be a better way to get it home. Finally, I told him that we'll probably drive the new car. I asked Sven if he wanted to dye some Easter eggs. His response, "no, then they would be dead." One of Sven's favorite desserts is Mochi ice cream. Yesterday we went to a new Asian Grocery store and bought a box. Tonight when I opened up the box, I discovered that it contained 5 packages. So, I told Sven there were 5 packages and he could have one of them. Then I gave him a package of 2 mochi balls. As he was eating, he said "there are 5 packages of mochi ice cream - that's more than one for each person in this family." So I decided to try some math. I asked him "how many mochi balls in each package?" and Sven replied "two". Then I asked "if there are 5 packages of mochi ice cream, how many mochi balls are there altogether? ", and Sven immediately answered "ten!" Erik and I were floored. Last time I tried multiplication with Sven, he was very resistant. Maybe they're doing word problems at school. 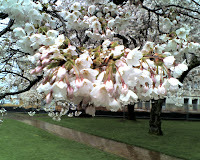 Every year we visit the Cherry Trees on the University of Washington quad. This year we took Sven and his bike. As usual, the trees were spectacular. Sven seemed to enjoy his bike adventures and even learned to dismount off of a falling bike gracefully. Mornings are hard for Sven - especially, when I leave for work before he is fully awake. But one ritual we have, that seems to make it easier for him, is family hug. It is something that Sven started - the three of us stand at the doorway, and wrap our arms around each other in a big hug. Erik and I never did family hugs growing up, so I was wondering if other families did it. Apparently some kids demand family hugs on a regular basis. Perhaps its innate. Maybe kids like the feeling of the family bonding together. Whatever it is, its a great way to start the day. Sven "created" a new law today. He told me that fish can be eaten by meat eaters and vegetarians. That is a law. He has been asking lots of questions about eating fish and being a vegetarian at the same time. We don't have good answers for him, as Erik eats fish, so I let him eat fish. And Sven "LOVES" fish. He has also been asking questions about what is "Fair". Ah, if only the Child Raising handbook had answers for all of these questions! Today Sven received an invitation to a Birthday party. The party will take place at the Pacific Science center, so it has a picture of an astronaut and dinosaur in the invitation. Sven looked at the invitation and said "There weren't any Astronauts when Dinosaurs lived." Last week Sven told me "I want to make laws that are fair for all." A few days ago, Sven was pretending to be an alien . He was wearing a yellow t-shirt, so he told me he had yellow skin, and I had black and grey stripped skin. Then Sven went down into the basement and told Erik "I have yellow skin!" Erik first thought that Sven was referring to his Asian-tinted skin, and had somehow picked up the term "yellow" for skin color. But after I explained the alien skin thing, Erik ruefully said, "that's what happens when you jump to conclusions." Having a young child puts a fresh perspective on things sometimes. "A one-eyed man ran into a bar and said ouch, because it was an iron bar." This is Sven's favorite joke -- well, its the only joke he can recite, so he says it several times a week, to whatever audience happens to be around. We never watch regular broadcast T.V. at our house - only the occasional movie. Yesterday, while we were in a microbrew for dinner with some friends, Sven was completely mesmerized by a basketball game (Texas vs. Texas A&M) that was on. However, based on his questions, he was very confused by the "movie". I realized after a few questions, that Sven thought that the game was a movie, and the commercials were part of the same plot. He would ask "why is she painting her nails pink? ", then a few seconds later "and why is there something black on their window", then a few seconds later "why are they pushing each other?" His conclusion - he didn't like basketball players because they pushed each other too much. I told him it was all part of the game, but that answer didn't seem to make any sense to him either. Sven's favorite babysitter is his former Nanny, Ellie. We still ask Ellie to babysit every couple of weeks, and Sven has decided that Ellie's favorite dinner is tortellini. Sven calls the tortellini "Ellie Pasta". Yesterday, while we were shopping, Sven grabbed a package of tortellini and said "I want some SpaghEllie." Sven is asking "Why" about everything! It sometimes tries the patience to deliver good and/or sufficient answers to all his questions. The other day he said "Why was Jesus nailed to a cross?" Apparently this topic came up among some friends at day care. Of course when you answer "because he was saying things that people didn't like to hear", you get the next question "why didn't people like to hear what he said", and so on. Sometimes it is tempting to short circuit the whole conversation and go straight to "I don't know", but I always feel guilty saying this - as if I am taking the easy way out. If I spend too much time trying to formulate an answer, Sven will peer into my face and say very earnestly "why Mommy why? ", as if the answer was of great importance to him - which it may be. This posting only makes sense to Fatboy Slim fans :) Erik has been teaching Sven some Fatboy Slim lyrics. So, now Sven goes around the house saying "Check it out now - the funk so rubber." The lyrics, as originally written, are "Check it out now - the funk soul brother." Erik is out of town for a few days so Sven gets to chat with him on the phone in the evenings. Yesterday Sven asked Erik "Daddy - why do some houses have phones in them?" Sunday evening, when Sven was talking to Erik, he got very upset that Erik wasn't in Seattle. He kept telling Erik that he had to come home "now" and said "I missed you". He was getting a little teary-eyed by the end of the call, and obviously didn't like Erik's answers. But as soon as he was off the phone, he was a happy bouncy five-year-old again. On Monday night, I asked Sven if he wanted to talk to Daddy and he said "Yes!" As soon as he got the phone he apologized to Erik for his behavior the previous night. Wow - I was impressed at his level of maturity! At the end of the call he said "bye bye Erik" and closed my cell phone. Then he told me "I'm old enough to call Daddy, Erik." Yesterday, Boxing Day, we walked into our neighborhood business district a couple of times, to help burn off the extra holiday calories. We live on a steep hill, which is a challenge for adults, let alone little kids. The first time we walked home, Sven said "this walk is too long for a small kid like me." So, I took pity on him and carried him on my back for the steepest part of the walk. The second time we walked home, we were with Ojiisan (my father). Since it was raining, Ojiisan offered to share his umbrella with Sven, so he wouldn't get wet. When we got to the steep hill, Sven and Ojiisan walked up hand in hand and Sven said "I'm helping Ojiisan up the hill because he's old." I guess Sven forgot that it was a long walk for a small kid like him. He seemed to take pride in "helping" Ojiisan up the hill. Then Sven explained to Ojiisan that he needed help because "old people get sick in the cold and rain." On Sunday we took Sven to the OMSI Star Wars exhibit. Sven had a great time - he especially liked the robots part of the exhibit. Then we let him get a new lightsaber for a souvenir toy. He held onto the new lightsaber for the entire drive back to Seattle. He didn't even take a nap, he was so excited. That evening, he said his lightsaber was his new friend and started referring to it as "she". When I asked him if the lightsaber was a girl he said "yes." He wanted to sleep with his new friend, but we told him it should sleep on the lower bunk instead. This morning, the first thing he wanted to do was see how his new friend was doing. He's pretty thrilled. For Sven's birthday, our friend Bev gave Sven a deck of alphabet flash cards. The "E" card has a picture of an envelope. When Erik showed it to Sven, Sven said "E is for email". Today we managed to set off the smoke alarm in our house for the first time since moving in. We were having a calzone party when the alarm went off. Since we had a dozen people in the house, it was a little noisey so not everybody noticed when Sven started ordering people to go outside. Sven was climbing up the stairs yelling, "you have to go outside now!" and then, "you have to go out on the deck in your bare feet!" Finally we figured out that he thought the smoke alarm was the fire alarm, similar to the fire alarm that went off in our hotel in London - which caused everybody to evacuate the building. A few of the guests got a good chuckle out of that one - they couldn't figure out why he was so insistent about going outside in bare feet in the freezing cold rain. Yesterday we received a very nice painting of a volcano by Granma. When we opened it up, Sven said "I want to call Granma." Then when he got on the phone he told Granma "I got a picture of a volcano that you made." On Saturday, Sven told me about an incident at Day Care that apparently disturbed him. Another kid was pulling on part of a tree in the playground. Sven decided that this was not good for the tree, so he threw woodchips at the kids jacket. When Sven told me about this, I said it was good that he was concerned about the tree, but throwing woodchips at another kid was not a good idea. Later that evening, we had some dinner guests over. At the dinner table Sven said "Guys - I have something important to say. At school, Camaron was pulling on part of the tree. And then I had a bad idea. I threw woodchips on Camaron's jacket." On Sunday I told Sven that the mornings we lighter and the evenings were darker because we changed the time. Sven said "well that's stupid". Well said! At least next year the conversion is after Halloween. Sven is growing up in the Cell Phone era. When he was about 1 1/2 years old, he would pick up Erik's old phone and would babble into the phone and would give a hearty laugh every once in awhile. We thought it was hilarious. Then he pressed the phone back to his ear and slowly reached over and handed me my towel, the whole time pretending to be listening to a conversation on the phone. "Hello Darfa Bader? I live in a new house and I have lots of toys. I like all my toys." This weekend we were in Froggy Sandy Cisco for a friend's wedding. Sven was the Ring Bearer and he was very handsome in his Tuxedo. He was especially proud of the bow tie and started noticing all the bow ties around, e.g. Wallace (as in Wallace and Gromit) has a bow tie. Sven made a new friend at the wedding named Jamie, and he spent several hours dancing with Jamie during the reception and dinner. They made a very cute couple. The day after the wedding we visited my sister's family. They have a new kitty named Charlie. As we were flying home to Seattle, we were talking to Sven about spelling his name. Sven said "S - V - E - N is Sven." Then he said "S - V - E - N is Charlie." Yesterday, Sven tried some Gruyere cheese. He said "I like Groovey Ear Cheese." This morning Sven asked about his Buzz Lightyear toothbrush. I had thrown it out months ago because it was getting worn out - but he was upset. He said "that teases me" -- I think he was trying to say "that peeves me". We were driving home from Oregon this weekend, and Sven was watching a movie on his DVD player that came with some previews. Sven called the previews "movie appetizers." Yesterday, Sven asked for some Jelly Bean candy from the bulk section of favorite local co-op. I asked him how many he wanted and he said "five." So, I asked him if he knew what 5 plus 5 was, and he didn't understand the question. When we got him I tried with fewer Jelly Beans. We started with 2 plus 2, and after some explanation, he finally gave me the right answer consistently. So, we graduated to 3 plus 3. That took much less time. But we were out of Jelly Beans because I let him eat the sum of each Arithmetic question. Later that evening we did 1 plus 1 and he said 2, but he was a little unsure about 1 plus 2 - he finally said 3. Then Sven said "5 plus 5 is 5 plus 5", and ended the conversation at that. He refused to discuss it further. Most of the time Sven's reluctance to say his real name is only slightly annoying, or even cute. But last weekend, we thought we were in deep trouble. We went up to Victoria, Canada for the weekend. When we arrived at Canadian Immigration, the Officer holding our passports looked at Sven, looked at his picture (which was taken when he was 4 months old) and then said to Sven "what's your name?" Sven looked shy and didn't answer. So, she said "do you know your name?" and Sven said "Tinkerbell." At this point, Erik and I tried to convey to Sven the importance of saying his real name, but he wouldn't cooperate. So, the Immigration Officer changed her question. Erik was holding Sven, so she said "do you know who he is?" indicating Erik. And Sven said "I don't know." What Sven really probably meant was "I don't want to answer these questions." Finally, in a quiet voice Sven said "I'm Thunder Nilsson.". At this point the Officer either took pity on us, or saw how futile the whole thing was, and let us go. As we left the Immigration office Sven said to me in a very small quiet voice "I'm Sven Michiya Namioka Thunder Nilsson." On the boat home, I asked Sven if we could practice what he was going to say when we arrived in the U.S. Sven said "I don't want to practice. That woman was naughty, asking my name." Hm, we'll have to work on the whole name thing before he reaches Kindergarten. We went drinking in London with some friends of mine from Secondary School. 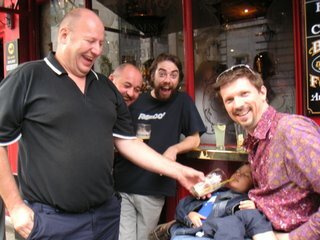 We found that several pubs in London don't allow minors, so we had to drink outside the pubs (drinking on the sidewalk with a minor is legal). Sven was very good about pub crawling with us. He flirted with lots of young, good looking women around Convent Gardens. He even tried to invite some of the women to play at our house. At the end of the day, Sven decided to nap in Erik's lap, while we finished a round of drinks. Danny thought it would be funny to insert Sven's straw into an empty Guinness glass and pose it next to the sleeping Sven. Pictured with Danny Broughton, are Nigel Thomas, Nigel's friend Chris (a fellow timpanist from Milan) and Erik holding Sven. Danny and Nigel are both ex-Finham Parkers. Its been a busy summer. We went on a two week trip to Ireland and London. Now we are settling into the new house. Sven's grandparents, Fafa and Granma, have moved into their mother-in-law unit on the ground floor. Sven loves to go down to their apartment to see what' going on. On the flight home from London (4 days before the recent big terrorist scare) Sven was watching some cartoons - I guess one featured an egg-like character. The next day Sven said "the egg person in the movie said there's the egg-sit." Then Sven laughed at the pun. This is the first time that Sven has repeated a pun to us. Is this a good development? Yesterday, Sven's active imagination finally caught up with him. We were in Portland (Erik just completed one day STP), and we met our friend Bob Wilcox for breakfast. Bob gave Sven a book of Chinese Ghost stories - actually anti-Ghost stories, that were translated into English in the PRC. It is a collection of stories on "How Not to Be Afraid of Ghosts." While we were waiting to get seated in the Restaurant, Sven wanted me to read some of them to him. Most of the stories were only a couple of pages long, but they contained some vivid descriptions of what the ghosts looked like. So, Sven asked me to draw some of them with the Restaurant supplied crayons. One was described as a bright flaming disk, that had twinkling eyes all over. So, I drew a yellow blob, with blues eyes, and flames coming off the end. All day long, Sven talked about the ghosts/spirits, and he pretended to be either the hero or the ghosts. Then, last night, the ghosts all came back to haunt him - literally. Poor Sven's very active imagination caught up with him, and he got out of bed several times complaining of ghosts flying in the hallway, in his room, etc. It took until 11:30 PM to calm him down so he could sleep. Erik hid the book, and we'll get back to it in a few years. Sven and I had a good time at the zoo recently. 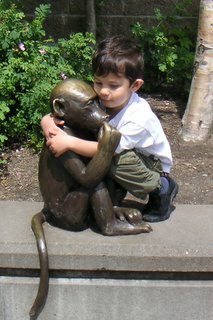 One of his favorite features are the sculptures near the zoo entrance. Sven is very excited by his new "bonk bed". He's been asking for one for awhile, so we got him one for the new house. Unfortunately, he bonked his head on his bonk bed the first time he took a nap in it. Yesterday, our friend Bob asked Sven if he liked his new house and he said "yes, I do." Then Bob asked "do you have your own room?" Sven replied "Yes, I have my own room, with a bonk bed." "I sleep on the up bed." Then Sven got a distressed look on his face and he continued, "But nobody will sleep on the down bed." "Somebody is being naughty about this." 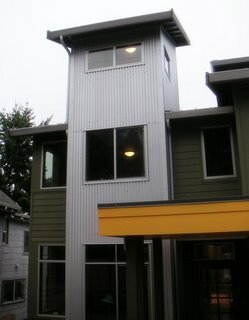 This picture of the new house shows the tower that is part of Sven's bedroom. Yesterday, Sven wet his underpants a little, while we were moving from old house to new. So, Erik took them off in a restroom and told Sven he was "going Commando", i.e. wearing pants with no underwear. Sven came out of the restroom and said "Mommy - babies that don't wear diapers are going amando." Sven told me everything he knows about house fires. A Fireman creates fires, and Firefighters put them out. Hm, makes sense. Also, a Firehouse is a house that is on fire. Update on cement (see previous post "Some Mint"): We passed a cement truck this weekend and Sven said "there's a Mint truck!" He was pretty excited. Sven now enjoys telling people about his favorite things. He is developing strong opinions at an early age! A few weeks ago Sven started saying that his favorite band is the "Red Hot Chili Peppers", though sometimes he calls them the "Big Hot Chili Peppers." When I asked Erik where this came from, he said they heard a RHCP song on the radio and when Sven asked who they were Erik told him the Red Hot Chili Peppers. So, Sven has decided they are his favorite band! Perhaps we should get him their latest CD. On Monday, Memorial Day, Erik was busy at a conference, so I decided that Sven and I would have lots of fun. We went to the Aquarium. Then rides at Seattle Center, followed by lunch at the Folklife festival. Then home for a nap. After his nap, I asked him if he wanted to go shopping for a new jacket. His old jacket is getting too small, but he won't give it up because it is black (his Darfa Bader cape). He said yes, he did want to go shopping for a suit. I explained that we were going shopping for a jacket, not a suit. We drove to Northgate Mall, and looked at 4 stores for a jacket, but couldn't find any in his size. We saw a nice black suit, but it was a size 8. Sven was disappointed that we didn't get it. However, we did manage to buy Sven some black Merrills that he picked out at Nordstrom. Nordstrom gave him a green balloon, as a treat for buying their shoes. After the shoe purchase he happily said "I've got new shoes on my feet, a balloon in my hand, you have a bag under your arm, and we're on the escabater!" So, I thought he was fully satisfied. That evening, when Erik got home, I asked Sven to tell Erik all the fun things we did. I thought he would mention the Aquarium and/or rides, and/or his new shoes. Instead he said "we saw a suit, but it wasn't a size 8. It was a size 4!" He still thinks he should get a suit. A couple of days ago, we were driving past a cement factory and Sven said "what's that?" Erik told him it was a cement maker. Sven started talking about mints, and I realized that he thought that Erik said "Some Mint" maker. For awhile it was a rather odd conversation. Erik was trying to explain how cement gets made, and Sven was responding with assertions about mints that come in bowls. Sven might now think that candy mints are delivered in some mint trucks. Sven is often the only child in a group of adults, so he has developed the need to assert himself conversationally. Often, when Erik and I are talking to a group of friends, or to each other, we hear Sven say "My turn to talk." So, we let Sven have a turn. But more often than not, Sven uses his "turn" to discuss whose turn it is to talk. We get into lots of circular conversations this way. I realized, after trying to explain to Sven when it is his turn to talk, that good social conversational manners, are not that easy to figure out. We've also noticed that when Sven feels very strongly about something, he'll repeat himself over and over, despite our best attempts to acknowledge what he said the first few times. We had a very nice Mother's Day. Sven and I made Nutella crepes for breakfast, and Erik cleaned up. Sven can shift all the dry ingredients, beat all the wet stuff, then stir the whole thing together. He's actually getting quite good around a kitchen (with the help of a large step stool). He can do everything required to make scrambled eggs, except turn on the stove. A few minutes later Sven said "Did you see the dress I got you? I got you a Princess Leia dress." Again, I played along and when I asked where it was, Sven said "upstairs, in my closet." So, we went upstairs and pretended to search the closet. But he was actually looking for a cymbal he thought was hidden in there. The most interesting part of this exchange was that Sven knew he was supposed to give me something. I wonder how he figured that out. Later, I got a big yummy box of Fran's chocolates!! That evening, we took my parents to Cirque de Soliel. I was a little worried that Sven might not be able to sit through a 2 hour show plus a 30 minute intermission. But he was mesmerized. He hardly stirred during the entire show. The only part he didn't like was a fake head getting blown off, because he didn't know it was fake. He thought it was a real person. On the way home he relived the evening by going through the program. My parents also greatly enjoyed the show, so we highly recommend the Cirque for the entire family! Sven has concluded that real objects are 'spensive, rather than the toy version. So, he will say "can I have a 'spensive puppy?" Unfortunately, Erik is very allergic to dogs, so Sven will never get a 'spensive puppy. Last weekend Sven said, "Can we go to the 'spensive lightsaber store and get a red one, and a green one, and a blue one?" Then he told us that he gets the red one (the Darfa Bader one), Erik gets the green one (the Yoda one), and I get the blue one.